Sometime around midsummer, we all look at our yards, filled in and blooming, and think about designing something new, dividing plants, or perhaps creating a new hedge. Attractive native shrubs are often overlooked—and occasionally hard to come by in local nurseries and garden centers—but they are well worth the effort to find. Already adapted to our particular climate and ecosystems, natives simply do well here—and look spectacular. Here are five options to consider. With a name like chokeberry, people aren’t exactly chomping at the bit to plant this native shrub. It’s unfortunate, because the chokeberry is one of the best shrubs you can grow in Illinois. Iroquois Beauty™ chokeberry (Aronia melanocarpa ‘Morton’) is starting to ripen. The beautiful black fruit stays on the plant longer than some other varieties. Not to be confused with the chokecherry tree (Prunus virginiana), chokeberry (Aronia sp.) is a fruiting shrub that ranges from 3 to 10 feet tall with red, purple, or black fruit. The name chokeberry comes from the astringency or dryness of the fruit, which may be the result of antioxidants. There are three main species: Aronia arbutifolia (red chokeberry), Aronia × prunifolia (purple chokeberry), and the most common, Aronia melanocarpa (black chokeberry). 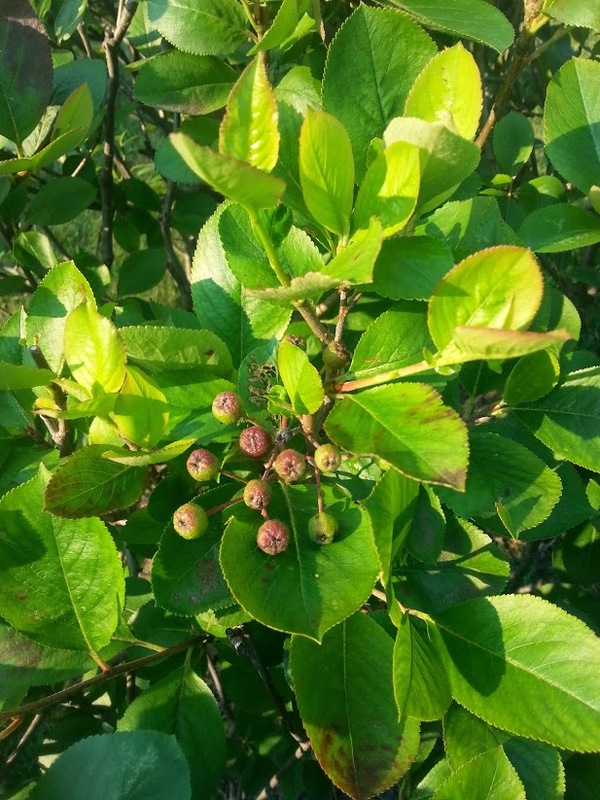 Aronia is an all-season plant. In spring to early summer, the plants become covered in white, apple blossom-like flowers for several days to weeks. The glossy green foliage holds up against extreme heat and drought, and in fall, these great landscape shrubs produce red, purple, or black fruit in combination with orange to red-scarlet fall color. The fruit attracts birds, though this may often be as late as February depending on Aronia species, food availability, and the density of your bird population. The fruit is also eaten by humans and is popular in Europe. Containing more antioxidants than blueberries and easier to grow, it’s a health food that you should definitely consider adding to your diet! Sweeten the fruit with honey or sugar to make a jam or syrup. I recommend ‘Viking’ for less astringent fruit that is good for harvesting. If fruit doesn’t interest you, consider ‘Professor Ed’ or the Chicagoland Grows variety ‘Morton’, both of which have ornamental fruit, stay somewhat small, and have excellent fall color. Aronia also takes well to renewal pruning if you wish to keep a larger variety at a smaller height. Buttonbush (Cephalanthus occidentalis) flowers are attractive, unique, and somewhat unworldly. These are growing by the water in the Lavin Evaluation Garden. Wouldn’t you want something called buttonbush in your yard? The white, butterfly-attracting flowers are arranged in little celestial spheres that are 1 to 2 inches in diameter, emerging between late May and late July (depending on the region). After the flowers have finished blooming, spherical seedheads remain on the plant, providing winter interest. 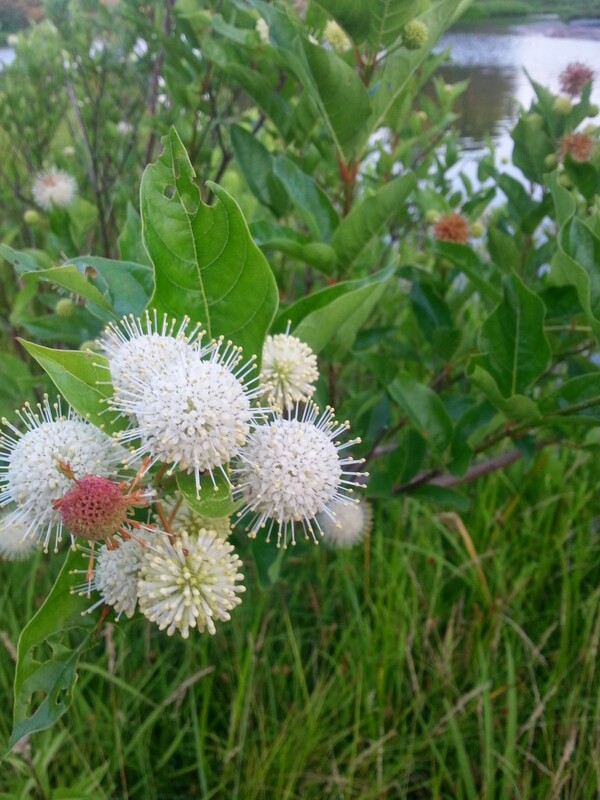 Buttonbush tolerates well-drained soil well, but loves it wet—making this an excellent choice for a rain garden plant! They can grow fast—a 6-inch shrub can easily grow to 5 feet within a few years, and can reach up to 15 feet when fully mature! 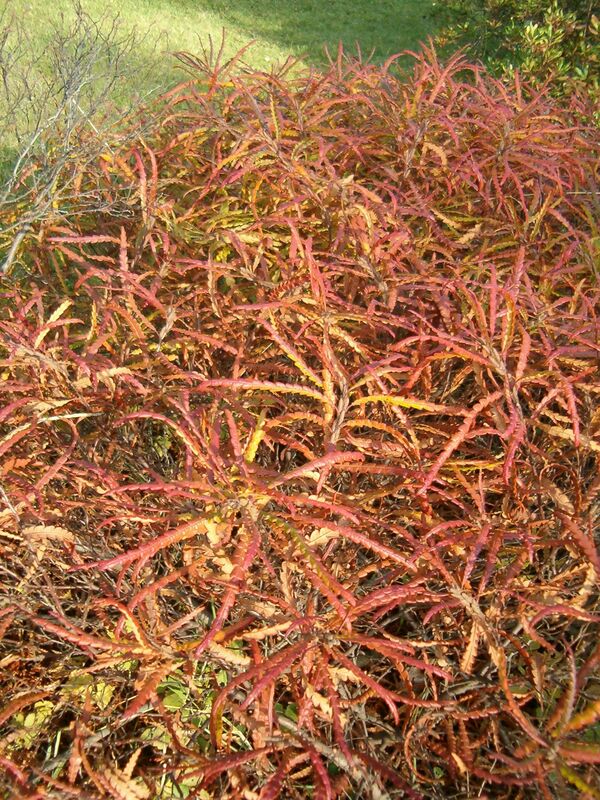 These shrubs also take well to renewal pruning, if you’d like to keep them short. They typically have a good rounded habit, but if you would like more uniformity, prune them in late winter or early spring. Sweet fern (Comptonia peregrina) leaves turn russet in the fall. Licensed under Creative Commons Attribution-Share Alike 3.0 via Wikimedia Commons. Use this plant if you want a unique-looking shrub that can tolerate poor—even salty!—soils. Sweet fern has deeply notched, glossy, fern-like leaves that have a sweet fragrance when crushed. It grows to be around 5 feet tall and 3 feet wide with a nice upright rounded habit, but sweet fern can produce large colonies if left to grow wild. The flowers and fruit won’t make a huge impact in the garden, but the catkins and fruit may be left as one of those subtle garden curiosities you need to go looking for. The leaves are edible, and are sometimes used for tea as well as insect repellant. These shrubs love part shade to full sun spots, and tolerate drought well. If your soil is fairly alkaline you may wish to avoid sweetfern, though they will tolerate a degree of alkalinity. Sweet gale’s (Myrica gale) catkins are certainly attractive, if not particularly showy. You can find a hedge of them in the Native Plant Garden, near the patio. If you’ve got a sunny to somewhat shady wet area, consider sweet gale for your garden. This native shrub prefers moist areas, but tolerates dryness and even some salt. It even fixes nitrogen in its roots, which can help improve the soil. The plants have an attractive mounded, candelabra-like habit, becoming 4 to 5 feet tall in the landscape. The leaves, which are a glossy dark green to gray-green, are fragrant when crushed. The branches, leaves and cones can be used like hops in brewing beer, and were used extensively before hops were widely available. Though sweetgale is native to North America, the species is also native to northern and western Europe, so it appears in European folklore and carries a history of use as a dye, insecticide, tea, and more! The flowers appear in summer and are not very showy, but the fruit that comes afterward offers a food source for yellow-rumped warblers on their way south. 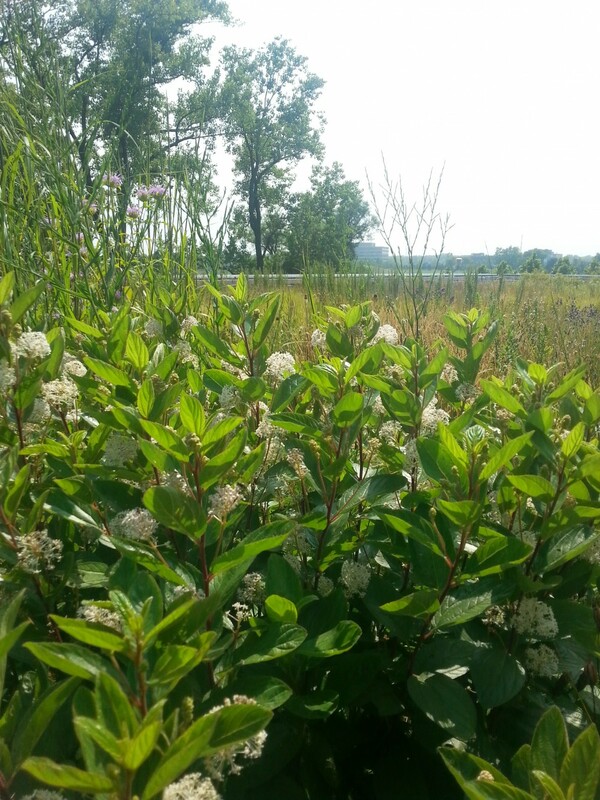 New Jersey tea (Ceanothus americanus) thrives on the green roof of the Plant Conservation Science Center. New Jersey tea is one native shrub that I hear recommended over and over again, but I can’t recall a time I’ve seen it in a landscape outside of public gardens. 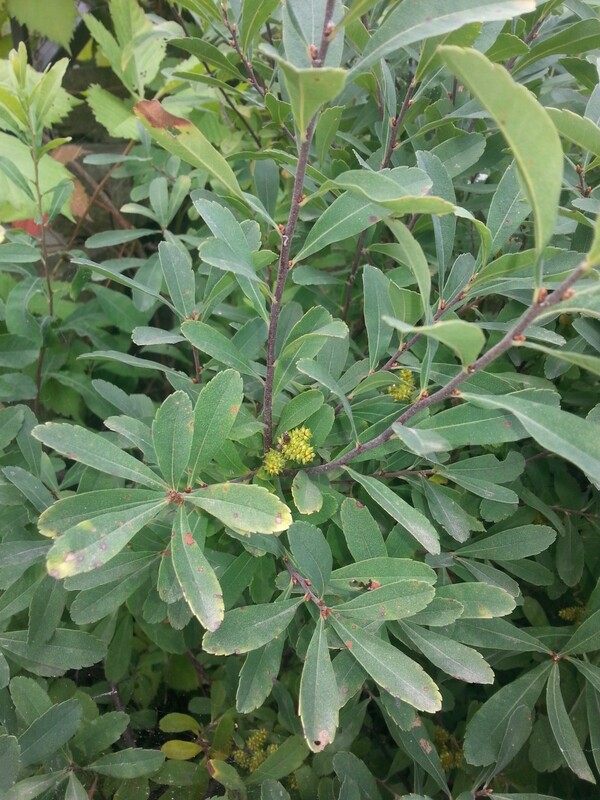 New Jersey tea is a small deciduous shrub that grows to about 4 or 5 feet in height. This nitrogen-fixing member of the buckthorn family grows in open woods and produces leaves that can be dried and used for tea. In fact, its leaves were often used as a tea substitute during the revolutionary war—providing a similar flavor to imported teas, though lacking in caffeine. New Jersey tea does well in moderately well-drained soils, but it develops a deep root system within a few years so it can withstand drought easily once established. It also provides nectar to butterflies and hummingbirds, acts as a butterfly host plant, and provides food for birds. The yellow twigs that remain in winter can be quite showy, and the white, fragrant flower clusters provide interest in summer. If you want to make a short but attractive native hedge, start with small plants spaced two to three feet apart. You might also consider Ceanothus ovatus for a hedge that will grow to only 3 feet high. Wonderful suggestions! Finding these lovely natives at our local nurseries is the the challenge. Sweet Gale is growing along the waters’ edge at our small inland lake in Northwest Michigan. It’s lovely all summer and has great fall color. I have heard from a knowledgeable nurseryman that the black chokeberry (Aronia melanocarpa) is avoided by rabbits while the red chokeberry (Aronia arbutifolia) is often chewed on. As rabbits seem to becoming a bigger problem every year in my yard, I thought I would share. New Jersey tea is also a wonderful suggestion. It is on my short list for additions to my yard. Midwest Groundcovers for New Jersey Tea (Ceanothus americanus). I planted a Prairie Garden with Aronia. Five years later I realized that rats were in love with the roots and happy as larks to make the Aronias a nesting place. How’s that for a little known tid bit? Next Next post: Lunchtime? How about a pickled pepper sandwich?